Terminator Salvation is finally a Terminator movie I am excited to see! Every new trailer, video, photo, or interview that is released makes me wish it was May 21st, 2009! 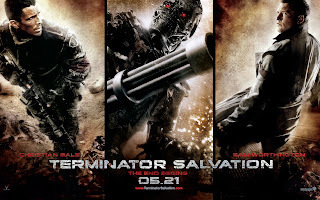 Terminator Salvation is the fourth movie in the Terminator series and is both a sequel and prequel at the same time which is interesting in itself. This time around the movie will not include Arnold which is why some believe it will not be a success, but others such as myself believe it will be even better without him! The third official trailer for Terminator Salvation was recently released on the official website and also here on YouTube. Enjoy! "Set in post-apocalyptic 2018, John Connor (Christian Bale), the man fated to be the leader of the human resistance against Skynet and its army of Terminators, and the future he was raised to believe in is altered in part by the appearance of Marcus Wright (Sam Worthington), a stranger whose last memory is of being on death row. Connor must decide whether Marcus has been sent from the future or rescued from the past. As Skynet prepares its final onslaught, Connor and Marcus both embark on an odyssey that takes them into the heart of Skynet's operations, where they find out a terrible secret that may lead to the possible annihilation of mankind." Looks pretty cool. Maybe this will renew the franchise like the dark Knight did for Batman.